The Colors of Your Week Coloring Club is INCLUDED WITH YOUR COLORING BOOK CLUBHOUSE MEMBERSHIP or You Can Subscribe Here for just $5 a month! If you enjoy reading your horoscope or using oracle cards, and you love coloring, you'll love The Colors of Your Week! Directions: This fun, intuitive and interactive coloring activity is designed to support you throughout the coming week. Read the Insight, choose your colors based on the palette and then color the included illustration when it feels right for you while reflecting on the week to come or how the week is going. I recommend printing the palette and insight and have that nearby as you Color Your Week. Most importantly, just have fun! 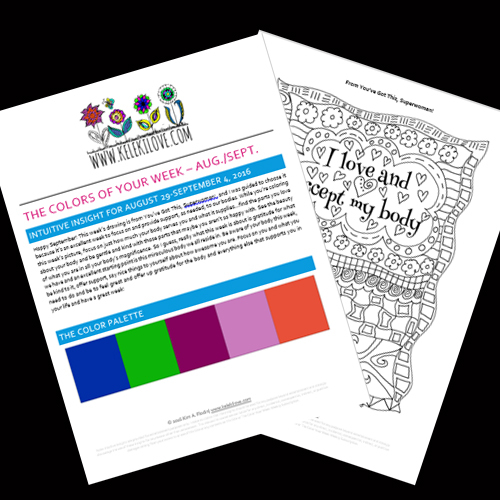 The Colors for Your Week Intuitive Insights, Color Palette and Coloring Page will be delivered weekly to your inbox every Sunday by Noon PST! This is a weekly subscription service and is included with your Coloring Book Clubhouse membership. Note: Intuitive Insights are provided for entertainment purposes only. I make no claims that the insights should be used for any purpose beyond entertainment and strongly discourage the use of these insights for any reason other than amusement. This site and its owner are not liable for any direct, incidental, consequential, indirect, or punitive damages arising from your access to or use of this Site or any contents on this Site orof The Color Your Week Weekly Subscription. Easily cancel with Paypal or use the CONTACT form on this site.